Drawing by an unknown artist of an unknown man. Outline of Mahatma Gandhi’s head with glasses (bold), white on black. 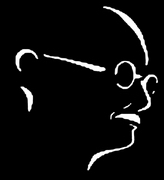 Outline of Mahatma Gandhi’s head with glasses, white on black. Outline of Mahatma Gandhi’s head with glasses, black on white. Line portrait of Mahatma Gandhi, white on black. Linocut of Mahatma Gandhi’s portrait, black on white. Sketch by an unknown artist of a spinning-wheel with atom model. Sketch by an unknown artist of a symbolised spinning-wheel. Sketch by an unknown artist of Mirabai. Sketch by an unknown artist of a bullock cart and village scene. Sketch by an unknown artist of a spinning woman. Sketch by an unknown artist of two spinning women.